today I found on Wikipedia this French artist - André Castaigne, and in 'his' Wikipedia Commons gallery there was an image of the most famous horse of the Antiquity - Bucephalus, and his most famous rider, Alexander the Great. From this edition of Quintus Curtius Rufus ''Historiae Alexandri Magni'' comes 'A supplement to Q. Curtius Rufus' (for the first 2 books are lost) and there we have a following story of the meeting between Alexander and his four-legged friend. Philonicus, a Pharsalian, considering the noble animal to deserve an illustrious master, brought him to Philip, and offered to sell him for sixteen talents. When the parties had reached a plain where the horse's speed and temper were to be tried; and one of the king's grooms attempted to mount him, the animal, refusing to be touched, reared and plunged violently; and his fierceness made each of the officers and servants who approached to mount him, relinquish the attempt. Philip regarding so wild and unmanageable an animal as useless, desired that he might be led away. Alexander, however, on hearing this order, cried out: "What an excellent horse are we "going to lose, for want of address and boldness to mount him!" 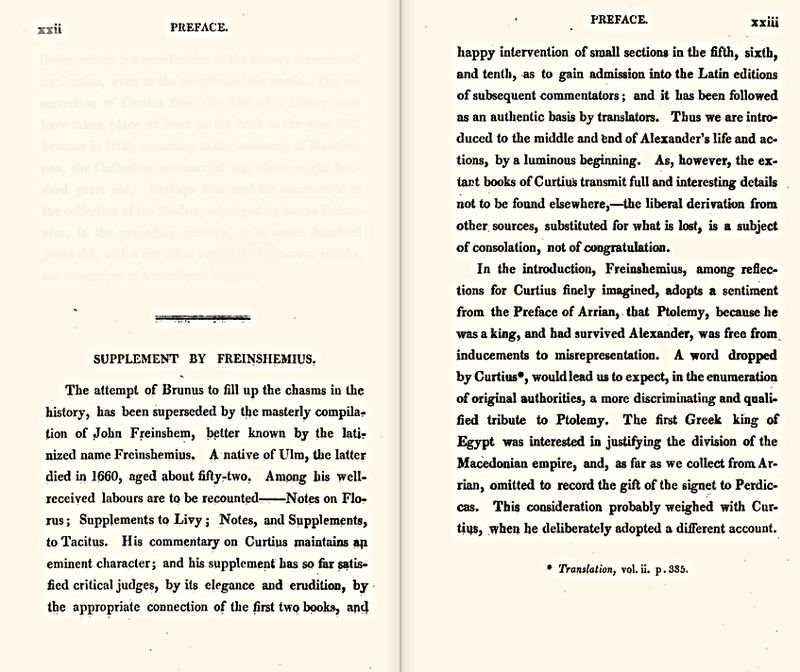 The king at first considered this exclamation to proceed from juvenile rashness; but on Alexander's insisting that it was practicable to ride the horse, permitted him to make the experiment, on condition that he should forfeit the price demanded for it if he failed. The young prince, exulting, advanced to Bucephalus,and seized his bridle; he had observed that the animal had started at the motion of his own shadow, he therefore turned his head toward the sun. Still the horse's fury is not much abated; Alexander strokes his mane, and speaks to him in a soothing voice. Still the horse foams with rage; but the prince, having gently thrown aside his cloak, vaults into the saddle. 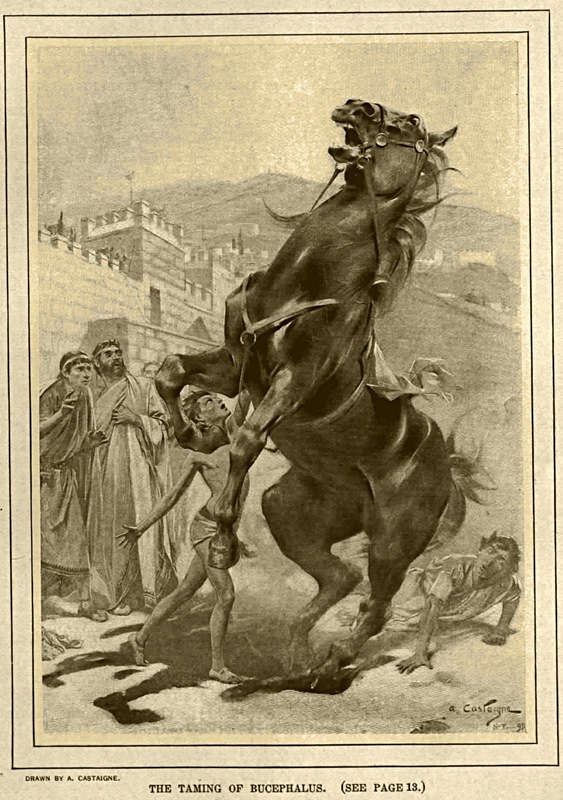 Bucephalus, unused to obey, plunges, rears, strikes up his hind-feet, tosses his neck and head, and struggles to overcome the controul of the bit, in order that he may dart away ungoverned. Alexander relaxes the forward rein, at the same moment spurring the horse, and with cheering tones animating him to exert all his swiftness. After flying over a long space, the wearied animal showed an inclination to stop; the prince, again spurring him, kept him at his full speed till his spirit was entirely subdued. After which, he returned with the horse gentle and tractable. When the prince alighted, his father, embracing him with tears of joy and kissing him, said, "My son, seek out a larger" empire, for Macedon is too small "for so vast a spirit." Bucephalus ever afterwards obeyed Alexander with uniform submission, while he maintained his original fierceness towards other persons. The noble animal accompanied his master through successive labours and dangers, till he was killed in the battle against Porus.